Where else can members register? As a club member, you have several options available to register yourself for an event. First, you can access register through the Events 2.0 feature on your club homepage. For more information on that, refer to this article. Your link will open in a new window. However, there are additional options for accessing your registration. 1. 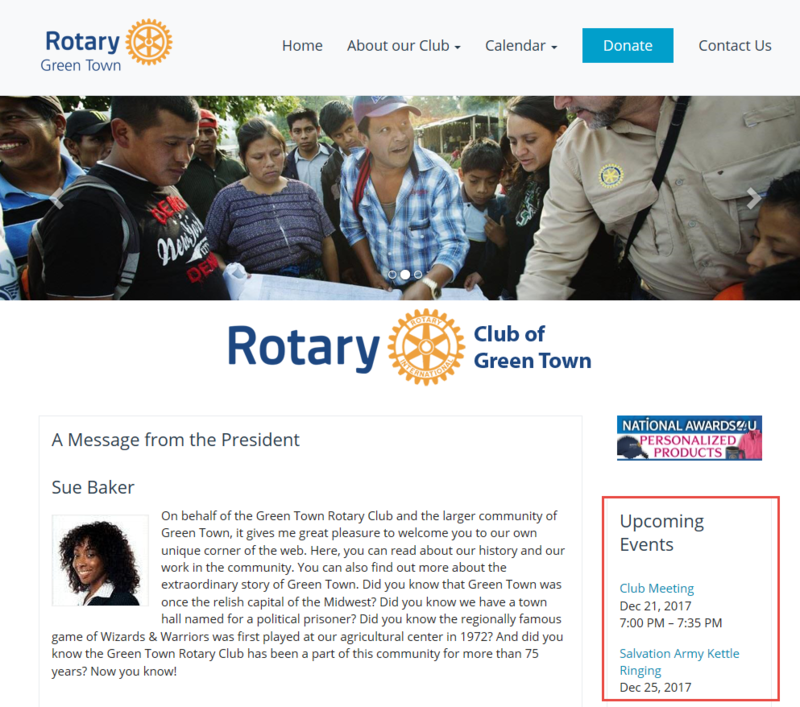 If your club has installed the events widget on the homepage, you will see a listing of upcoming events on your club webpage. The location of the events widget varies according to the desires of your club. In the example below, you can see the events widget in the middle of the page, under the heading of Upcoming Events. 2. To register for the event, click on the event name as displayed in the widget. This works whether or not you are logged in to the home site. 3. You are now on the event information page, containing details about the time and place of the event. On the left hand side of the page, you will see a section with the heading Online Registration. Under this heading is a button labelled Members. If non-member guests are permitted to register, there will also be a Guests button. 4. If you are logged in, clicking on Members will take you to the event registration screen. If you are not logged in, you will be prompted to do so, then taken to the event registration screen. 5. You are now on the event page, where you can register, decline, invite guests and pay for registration. Under the heading Register Me, you will see two buttons. Click Register Me if you wish to attend the event, and Decline if you do not. 6. When you click Register Me, you will be given a chance to confirm your contact details in the fields provided. Click Confirm to save your information, or Cancel to discard any change you have made. 7. Beneath the Register Me box, you will see a box with the header Guests. Here, you can register a non-member guest, such as a spouse or friends. Click the blue Register Additional Guests button to do this. 8. You will now be prompted to enter contact details for your non-member guest. The First Name and Last Name fields are mandatory. When you have finished entering these details, click Save to add your guest, or Cancel to discard the information. 9. Finally, if there is a fee associated with the event, you will also see a box marked Pay Online. Enter the information in the fields provided. Note: All ClubRunner transactions are handled by a secure payment provider, and neither ClubRunner or Rotary International have access to your credit card details. 9. At the bottom of the Pay Online box, you are presented with a security feature. You will see an image of random text and letters on a background that slightly obscures or distorts the text. This feature prevents an automated or fake registrations, and helps ensure every registrant is a real person. Enter the letters and numbers you see in the image in the field provided, and then click Register. The event chair or your club executives have the option to email an event invitation. You can use the link in this email to register yourself or your guests. 1. Sign in to your personal email account, and open the email invitation. It will contain a brief message and outline of the event, and a link labelled Attend or Decline. Click on that link. 2. 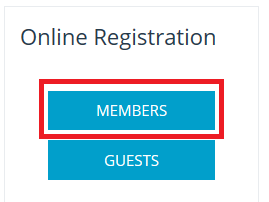 You are now on an event services page, where you can register for the event, decline to attend, register non-member guests, and handle payment for the event. To register, click Register Me. If you do not wish to attend, click Decline. 3. Beneath the Register Me box, you will see a box with the header Guests. Here, you can register a non-member guest, such as a spouse or friends. Click the Register Additional Guests button to do this. How does a guest register for an event? How do I Carry Current Officers Over to the Next Year? 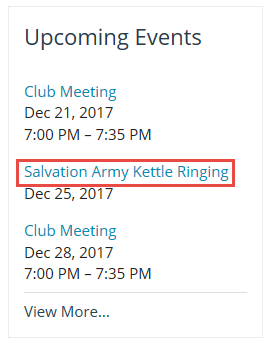 How do I set my meeting information? 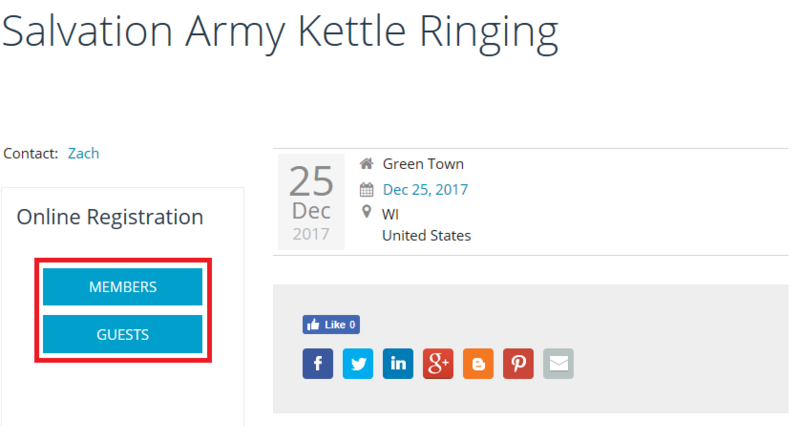 How Do I Add a Calendar Item?